Christmas deserves a special dessert. This Cranberry Christmas Cake is one such dessert. 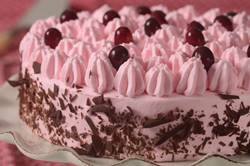 It is remarkably similar to a Black Forest Cake, but instead of cherries, it uses candied cranberries. It starts with a chocolate genoise that is filled with the cranberries and chocolate whipped cream. And then the whole cake is covered with stabilized whipped cream. So festive, so beautiful, and so delicious. This Cranberry Christmas Cake is very loosely based on a recipe in Alice Medrich 's excellent book 'Cocolat'. I think some people shy away from making party cakes as they are a lot of work. The key to success is to make some of the components ahead of time. You can make the chocolate genoise ahead and refrigerate it for up to three days or it can be frozen for a month. The candied cranberries can be made and refrigerated for two weeks. That way when you want to make this dessert all you need to do is to make the chocolate filling and whipped cream frosting and then assemble the cake. I find it best to make this cake at least a day before you want to serve it so the flavors have time to soften and mingle. Like other sponge cakes, a Genoise is leavened solely by the air beaten into the egg and sugar mixture. To make a light and airy genoise we first warm the eggs and sugar, over a water bath, which melts the sugar so that the eggs will reach their full volume when beaten. The eggs and sugar are beaten until thick and cool, and you will notice that the batter will become lighter and paler in color as it thickens. Warm melted butter (you can use clarified butter) is added to the batter which makes the genoise light and tender with a nice flavor. The melted butter needs to be warm, however, so it does not solidify once it is added to the cake batter, causing streaks, or worse yet, causing the batter to deflate. The Whipped Cream Frosting is stabilized with gelatin which makes the cream firm enough to pipe and it will also hold longer at room temperature. I used unflavored powdered gelatin which is tiny granules that are tasteless, colorless, and odorless. It is used as a thickening agent but only becomes active when dissolved in a hot liquid. Powdered unflavored gelatin is sold on the baking isle of grocery stores and is packaged in small boxes that contain four paper envelopes of powdered gelatin. You need just one - 1/4 ounce (7 grams) (scant tablespoon) envelope. Candied Cranberries: Place the cranberries into an 8 cup (2 liter) stainless steel (or other heatproof) bowl. Fill a large saucepan with a few inches (5 cm) of water and bring to a simmer. Meanwhile, combine the sugar and water in a small saucepan and bring to a boil. Pour the boiling syrup over the cranberries and cover the bowl with aluminum foil. Place the covered bowl of cranberries over the saucepan of simmering water and let the berries 'steam' for about 60 minutes. Remove from heat and let cool. Let the berries sit in the syrup, covered, for about 4 days at room temperature. If not using right away, place the berries, still in their syrup, in the refrigerator for up to two weeks. Chocolate Genoise: Preheat your oven to 350 degrees F (180 degrees C). Butter, or spray with a non stick spray, a 9 x 2 inch (23 x 5 cm) round cake pan and line the bottom of the pan with parchment paper. Sift the flour with the salt and cocoa powder. In a heatproof bowl whisk the eggs with the sugar. Place the bowl over a saucepan of simmering water. Whisking constantly, heat the eggs and sugar until lukewarm to the touch (this will take about 3-5 minutes). Remove from heat and transfer the mixture to the bowl of your electric stand mixer, fitted with the whisk attachment (or with a hand mixer). Beat on high speed (about 3-5 minutes) until the egg mixture has cooled, tripled in volume, and looks like softly whipped cream (the batter will fall back into the bowl in a ribbon-like pattern). Beat in the vanilla extract. Then sift about one-third of the flour mixture over the whipped eggs and gently fold in using a large rubber spatula or whisk. Fold in half of the remaining flour, and then fold in the rest. (Do not over mix or the batter will deflate). Take about 1 cup (240 ml) of the batter and fold it into the hot butter. (This lightens the butter.) Then, with a spatula, gently fold the butter mixture completely into the egg batter. Pour into your prepared pan, smoothing the top. Bake for about 18 - 22 minutes or until the cake shrinks slightly from the edges of the pan and the top springs back when lightly pressed. (A toothpick inserted into the center of the cake comes out clean.) Cool on a metal rack. When the cake has cooled completely, run a small spatula or knife around the edges to release the cake. Well wrapped, the genoise will keep two days in the refrigerator or it can be frozen for a couple of months. Soaking Syrup: Drain the candied cranberries, reserving the syrup. In a small bowl stir 1/3 cup (80 ml/grams) of the drained cranberry syrup with the 2 tablespoons of Kirsch. Chocolate Filling: Melt the chocolate in a heatproof bowl placed over a saucepan of simmering water. Let cool to just above room temperature. In the bowl of your electric stand mixer, fitted with the whisk attachment (or with a hand mixer), beat the cold heavy whipping cream until soft peaks form. With a rubber spatula or whisk quickly fold about 1/3 of the whipped cream into the chocolate mixture. Then fold in the rest of the whipped cream. Place the chocolate cream in a pastry bag fitted with a 1/2 inch (1.25 cm) plain tip (I used a Wilton 1A). Assemble the Cake: Using a long knife, cut the chocolate genoise, horizontally, into two layers. Turn over the top layer of the cake (so the top of the cake becomes the bottom) and center it on your cake turntable or serving plate. With a pastry brush, soak the layer of the genoise with about 2 tablespoons of the soaking syrup. Next, pipe the chocolate filling, in concentric circles, on the moistened genoise. Place the drained cranberries evenly over the chocolate cream to cover the cream completely. Moisten the cut side of the second genoise layer with about 2 tablespoons syrup. Place cut-side down on top of chocolate cream, gently pressing to compact. Brush the top layer with syrup. With a spatula, smooths the sides of the cake. Place the cake in the refrigerator until set (about 15-30 minutes) while you make the Whipped Cream Frosting. Frosting: Place the cranberry syrup in a small saucepan and heat until warm. Meanwhile, in a small cup, sprinkle the gelatin over the cold water and let stand about 2-3 minutes or until the gelatin has become soft and spongy. Add the gelatin to the warm cranberry syrup and heat (over low heat), stirring constantly, until the gelatin has dissolved. Remove from heat and let the mixture cool to room temperature. Then, in the bowl of your electric stand mixer, fitted with the whisk attachment (or with a hand mixer), beat the cold whipping cream with the vanilla extract and sugar until soft peaks form. Slowly add the cranberry syrup and food coloring (if using) to the whipped cream, beating to medium firm peaks. Place the cream in a piping bag, fitted with a star tip (I used an Ateco #827). Spread a thin layer of frosting over the top and sides of the cake, using a spatula to make it nice and smooth. (This is called a crumb coat.) Place the cake in the refrigerator for about 15 minutes or until the frosting is firm. Then pipe a thick layer of whipping cream over top and sides of cake and spread until nice and smooth. With the remaining cream pipe rosebuds over the entire top surface of the cake. If desired, press grated or shaved chocolate on the sides of the cake. At this point refrigerate the cake, covered, overnight before serving (this allows time for the flavors to mingle). Just before serving, you can decorate the top of the cake with fresh cranberries. Bring the cake to room temperature before serving.